The speed and pattern of your heartbeat is called your heart rhythm and can be felt by feeling the pulse. Your heart rhythm is set by signals from the heart’s electrical system. An abnormal heart rhythm is called an arrhythmia. 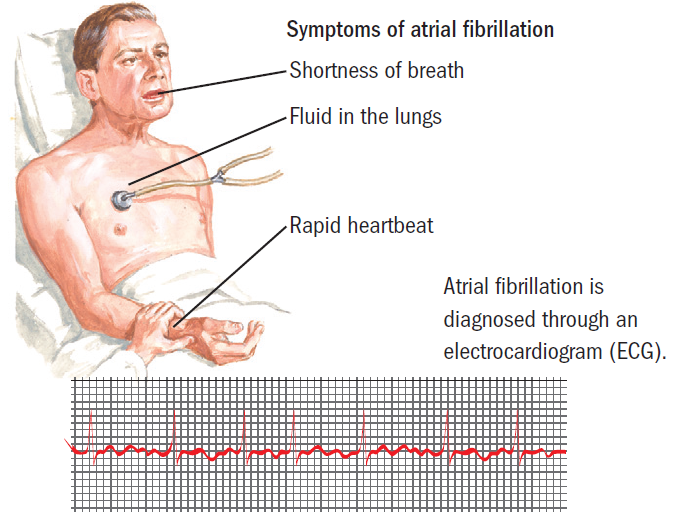 Atrial fibrillation is one type of abnormal rhythm. The muscle looks as if it is wiggling instead of squeezing (contracting). The human heart has four chambers. The upper ones are called atria; the lower ones, ventricles. All chambers must squeeze in a certain way to move the blood properly. Your heart’s electrical system involves specialized cells that tell the heart when to beat. If these cells malfunction and send extra electrical signals, the atria beat very quickly and uneven. A fibrillating atrium, however, has small, irregular, fast contractions. All the blood inside the atria is not pumped into ventricles, so blood pools. Pooled blood may clot, and clots can be pushed into the bloodstream and cause strokes. Ventricles work harder to get blood to the body, and heart failure may result. Among the many causes, the most common is aging. Others are heart problems such as hypertension (high blood pressure), congestive heart failure (CHF), and mitral valve disease (mitral stenosis). Lung diseases, other illnesses (e.g., diabetes), and overactive thyroid are more causes. Caffeine, nicotine (cigarettes), and too much alcohol can cause it or make it worse. 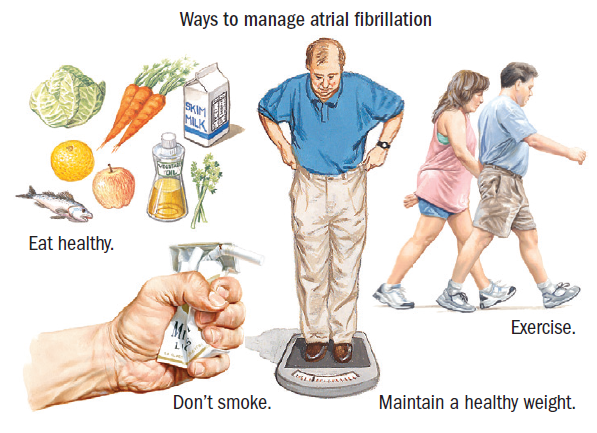 Many people have atrial fibrillation and never feel it. Symptoms often include the feeling of irregular or too fast (palpitations) heartbeats. Difficulty breathing, chest pain, or fainting may occur. Some people feel tired or cannot exercise. Chest pain or signs of stroke must be checked immediately. The doctor looks for a certain pattern on an electrocardiogram (ECG), which shows the heart’s electrical activity. The doctor may check movements of the atria with an echocardiogram (using ultrasound to examine the heart and capture the moving images on a video). If your atrial fibrillation comes and goes, your doctor may order a portable recorder of your heart rhythm (Holter monitor). Treatment focuses on the cause. For example, if the person has thyroid disease, that illness is treated. If the cause is too much caffeine or excess alcohol, less should be used. Controlling heart rhythm and the fibrillation rate with drugs is important. These medications are known as antiarrhythmics and are used to slow down the heart rate and make it regular. Sometimes atrial fibrillation stops on its own. 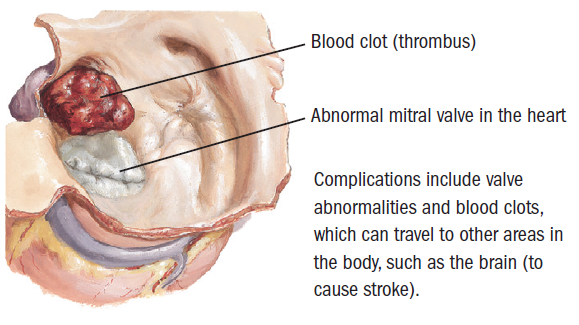 Clots are one complication of fibrillation. Blood thinners (anticoagulants) such as warfarin (e.g., Coumadin®) may be given for clots or to prevent them. This drug causes easy bruising or bleeding, so drug levels are checked regularly. The abnormal rhythm can sometimes be shocked back to normal (called cardioversion). During this procedure, a heart specialist (cardiologist) will give your heart a brief electric shock in attempting to briefly stop all electrical activity, hoping that the normal heart rhythm will take over. Chest pain, low blood pressure, CHF, or other serious symptoms may require emergency cardioversion. 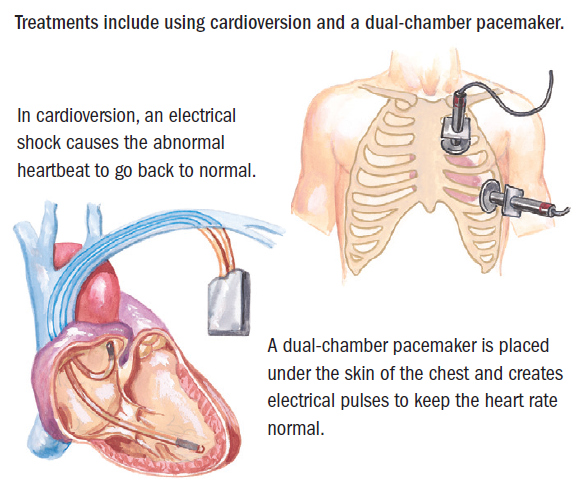 A dual-chamber pacemaker may be placed. A heart catheter or surgery (maze procedure) may be used to destroy the part of the heart causing fibrillation. DO eat a heart-healthy diet (less fat and cholesterol). DO keep to an ideal body weight. DO exercise as much as you can if you are taking the proper drugs and have no symptoms. DO take your medicines as prescribed. Have blood drug levels checked. DO call your doctor if you have drug side effects or if you have new or worsening symptoms (dizziness, chest pain or tightness, fainting, shortness of breath). DON’T do activities that cause bruising if you are taking a blood thinner.